Alternating Current. Electricity is characterised by the movement of electrons through a conductor. In a DC circuit (see DC, below) the electrons always move in the same direction (from negative to positive). In AC circuits the electron movement alternates in direction. In some (e.g. mains) circuits, the direction of electron movement alternates regularly at a fixed frequency (50 Hz, in the case of UK mains). In other circuits (e.g. audio) the electron flow follows a complicated pattern, corresponding with the frequency and amplitude of the combined signal. Generally the word active is used to describe equipment that requires a power source (as opposed to passive equipment, which does not). Not all active equipment is mains powered (active DI boxes and effects or volume pedals are usually battery or phantom powered). In loudspeaker systems, crossovers are commonly described as active or passive, and historically these terms were also used to distinguish between (active) loudspeakers that required an external crossover with a separate amplifier for each driver and (passive) loudspeakers that could be run directly from a single amplifier channel. In recent years, however, loudspeakers that have an inbuilt amplifier have become very common, and these are also - quite reasonably - described as active. This can give rise to confusion, as many loudspeaker manufacturers and audio professionals still use these terms to refer to their earlier (crossover‑based) meanings. Also, some modern ‘passive’ loudspeakers (e.g. the Martin Audio S15 and S18, which we use), have an active/passive switch. Here, the active setting is for use with an external active crossover, while the passive setting routes the input signal through the speaker's internal passive crossover. According to the more recent idiom, however, whichever setting is used the loudspeaker is nevertheless passive in the sense that it does not contain an amplifier. After Fade Listen. A switch routing the post‑fade signal (from a channel, group or auxiliary) to the mixer's meters and headphones. See the Mixers page for more details. The word Amp is more commonly used than the word Ampere (Symbol A) for the SI unit of electric current. It is defined as a flow of one Coulomb (the SI unit of electric charge) per second. Amp is also used to mean Amplifier (there is a difference!). The question: ‘how many amps do you need?’ could mean ‘how many amplifiers do you need?’ or ‘how much current does your equipment draw?’. In practice, the context of the question will usually make the meaning obvious. A device that produces gain - which can be positive or negative - in an electrical or electronic circuit. For information on PA amplifiers see the section on Amplifiers. The fader output from a mixer channel can be routed to the main left and right outputs (and, if the mixer has them, to groups). Extra channel outputs (individually controlled by knobs in the channel strip) are usually known as Auxiliary Outputs. A signal transmission protocol in which two copies of the signal are transmitted on separate conductors. The two signal copies are opposite in polarity but otherwise identical. The receiving device responds to the difference between the signals, so that any cable‑borne interference (which will be in the same polarity on both conductors) is cancelled. In balanced cables, the signal ground is not connected to system grounds: the "screen" connection (Pin 1 of a standard XLR connector) is just that - a screen - and does not form part of the signal path. Also see Unbalanced, below. Frequency range (in Octaves). See the Parametric EQ page for a little more detail. A general term for the lowest audible frequencies. There is no universal definition, but Bass generally describes frequencies below about 200Hz. On most mixers, fixed‑frequency Bass EQ controls operate at 80 or 100Hz. A graph plotting a loudspeaker's beamwidth (i.e. angle of horizontal dispersion) against frequency. Usually this will be the angle at which the loudspeaker's output has fallen by 6dB from its on‑axis output, but sometimes −10dB or −12dB angles may be given instead or as well; the level(s) will always be stated, as the graph would not otherwise impart any useful information. Also see Isobar Plots and Polar Plots. Literally, Heart‑Shaped. A cardioid microphone has a heart‑shaped sensitivity pattern, and is more sensitive to sounds arriving from the front than from the sides or rear of its capsule. A device that reduces the Dynamic Range of an audio signal. See the Compressors page for more details. A type of microphone. See the Microphones page for further details. Peak to RMS ratio. In a signal with an RMS voltage of 2V and a peak voltage of 8V, the crest factor is 4. The point at which reflected sound is equal in level to direct sound. See the section on Speaker Position for more details. The ratio between the load (loudspeaker) impedance and an amplifier's output impedance (damping factor = load impedance ÷ output impedance). The damping factor represents the ability of an amplifier to control loudspeaker cone movement (the higher the damping factor, the greater the control). See the Amplifiers page for more details. Abbreviation for Decibel. See the Decibel page for further information, and explanation of common suffixes (dBA, dBu, dBV, etc.). Direct Current. Electricity is characterised by the movement of electrons through a conductor. In a DC circuit the electrons always move in the same direction (from negative to positive). In AC circuits (see AC, above) the electron movement alternates in direction. Direct Input, or Direct Injection. See the DI Box page. A non‑linear difference between input and output signals in any audio device. Ideally, any audio device (e.g. pickup, DI box, mixer channel, amplifier or speaker) will change a signal in magnitude, but not in any other way. Any non‑linear change in the waveform (even if - as in the case of compression or EQ - the change is intentional) represents distortion. Proportional changes in magnitude between input and output are linear changes. Distortion describes any non‑linear changes. Some types of distortion are more objectionable than others: the ear can and does adjust to moderate shifts in frequency balance (tone), so that mild tonal colouration that is initially noticeable may become unnoticeable after a short time. Also, some tonal changes (particularly modest reduction in the upper midrange at high volume) may sound ‘better’ than the undistorted signal. The sort of distortion that is produced when circuits are saturated (resulting in squaring of the signal peaks, also known as clipping) is generally noticeable when the total distortion exceeds about 1%, and can become objectionable - and remain objectionable over time - at higher levels. Here too, however, mild distortion - e.g. saturation of analogue recording devices or ‘overdriven’ guitars - can sometimes sound ‘better’ than the undistorted signal. The word Dynamic (or sometimes Dynamics) is often also used to describe processing sections, particularly in the digital domain. Compressors and Expanders are dynamic processors, in that they affect the dynamic range - see below - of a signal to which they are applied. Expressed in Decibels: the difference between the quietest and loudest parts of a sound. Devices that change a signal by adding altered versions of the original signal to it (see the Effects Units page). Electromotive Force (ε), measured in Volts. Generally the same thing as Potential Difference, but in audio equipment you will most commonly find it in references to ‘Back-EMF’, where a device (such as a loudspeaker) that can act as a generator produces voltage that opposes input voltage. Effect that adds synthesised harmonics to the original sound. See Enhancers and Exciters on the Other Effects page for more details. Equalisation or Equaliser (see Equaliser, below). A form of tone control. Early audio equipment tended to reproduce audible frequencies very unevenly, accentuating some frequencies and reducing others. Filter circuits, acting on parts of the audio frequency range, were initially designed to correct (equalise) this. Although equalisers are now more often used for other purposes (either to combat feedback or ‘creatively’ to tailor the sound for individual tastes), the original description is still used universally. For details of modern EQ, see the Graphic EQ and Parametric EQ pages, and the EQ section on the Mixers page. A device that increases the Dynamic Range of an audio signal. See the Expanders page for more details. Fader is the name generally used to describe a Linear Potentiometer, which is a form of variable resistor that uses a sliding (rather than a rotating) knob to move a contact along a resistive track. These are used to control Channel, Group, VCA and Main Output levels in almost all live consoles. Note that Linear is also used to describe standard variable resistors ("Pots") with a Linear Taper (i.e. those in which resistance varies in direct proportion to rotation of the shaft, as opposed to those with a Logarithmic Taper). Often these will be differentiated by having the word LIN or LOG stamped on the housing. Faders may have linear‑ or logarithmic‑tapered tracks, depending on application and circuit‑design. Feedback is what happens when some or all of the output of a device or system is fed to its input. There are two kinds: positive feedback (where the output reinforces the input) and negative feedback (where the output opposes the input). Many electronic circuits (as well as other devices) use negative feedback intentionally as a means of regulating output. Acoustic feedback in audio systems, however, is undesirable, and most commonly occurs when a microphone or other input device picks up the sound coming from loudspeakers. Loudspeaker sound can cause feedback through airborne transmission, or can be transmitted through physical structures (e.g. stage, microphone stands, turntable supports) by vibration. An English measure of capacity equal to half a Kilderkin. Two Firkin = one Kilderkin = 18 gallons (originally an excessive amount of beer, but now more widely used to mean an excessive amount of anything: for example, two Firkin loud would be excessively loud). Usually stated in Decibels: the ratio between input voltage and output voltage. Note that the ratio does not have to be positive (the output voltage may be a fraction of the input voltage, rather than a multiple of it): although in common vocabulary ‘gain’ has connotations of ‘increase’, in electronic circuits gain can be negative as well as positive, so that a PAD switch or attenuator is applying negative gain (−dB). Unit of frequency (abbreviation Hz): the number of cycles per second. High‑Frequency. In audio frequencies (nominally from 20Hz to 20kHz), there is no universal definition of what counts as high‑frequency, but depending on who is speaking it can refer to anywhere from about 1kHz upwards (and in many loudspeaker systems the HF driver operates from a crossover point of 1kHz). Most people would describe sounds above about 3kHz as high‑frequency. On most mixers, HF EQ controls operate from a nominal frequency of around 10kHz. A filter that allows only frequencies higher than its cut‑off point to pass. High‑Pass Filter (see High‑Pass, above). Literally,‘excessively heart‑shaped’. A Hypercardioid microphone has a narrower sensitivity pattern than a Cardioid or Supercardioid microphone. International Electrotechnical Commission. An international standards agency for electric, electronic and related technologies. Impedance (unit of measurement the Ohm, symbol Ω) is the AC equivalent of resistance, and represents opposition to the flow of current. On a mixer, an insert is a point at which an external device (e.g. compressor) can be inserted in the signal path. See the Mixers page for further details. The clarity of speech in an auditorium (whether or not a PA system is in use). In rooms where reverberation times exceed about 1.5 seconds (−60dB), intelligibility is often poor. Regardless of reverberation times, intelligibility deteriorates the further any audience position lies beyond the critical distance. A standard measure of intelligibility is derived from the proportion of random spoken words a listener can correctly identify. This is a more difficult task than listening to a speech or announcement, where in the context of a sentence a listener may be able to guess any less coherent words. Sound pressure from a point source diminishes in free space according to the inverse square law: the pressure is inversely proportional to the square of the distance from the source. This means that the level (in decibels) reduces by 6dB for each doubling of distance from the source. IP ratings are generally found on Ceeform connectors (IP44 is commonplace, although for demanding outdoor situations - for example where there is standing water - IP56 or higher may be required). A graph showing a loudspeaker's angle of horizontal or vertical dispersion, in which lines connecting points of equal sound pressure (isobars) are plotted against frequency. Usually the lines are taken from points at which the loudspeaker's output has fallen by 6dB from its on‑axis output, but sometimes −10dB or −12dB angles may be given as well or instead. In the example below, the lighter grey boundary marks the −6dB points, while the darker boundary marks −12dB: note that the two lines from this loudspeaker (a d&b audiotechnik E12) are almost exactly parallel, meaning that there is no appreciable tonal variation - only a change in level - as a listener moves further off‑axis. Also see Beamwidth Plots and Polar Plots. Lavaliere Microphone is often used to refer to a microphone that is hung around the neck or clipped onto a tie or lapel. A lavaliere is a type of cravat, which is how the term came to be used for neck‑worn microphones. Low Frequency. In audio frequencies (nominally from 20Hz to 20kHz), there is no universal definition of what counts as low frequency, but the term is often used interchangeably with Bass. A device that reduces the gain on large input signals, limiting its output voltage (see the Limiters page). The point at which reflected sound is 10dB lower in level than direct sound. See the section on Speaker Position for more details. A linear relationship is one that can be represented by a straight line on a graph. In PA equipment, if input voltage is plotted on one axis and output voltage plotted on another, the effect of the equipment is linear if the result is a straight line. Linearity represents freedom from distortion. A linear power supply is one in which output voltage is proportional to input voltage. The term is usually used to refer to power supplies that use a transformer to convert the input voltage to a lower or higher output voltage, but while the effect of the transformer itself is linear, voltage regulation on the secondary side of the transformer ensures the regulated output voltage remains stable even if there are fluctuations in the input voltage. Although the transformer is linear, the power supply as a whole is not. In audio circuits, line‑level refers to a nominal operating voltage of 315mV (−10 dBV) in domestic equipment, or 1.23V (+4 dBu) in professional equipment. A device used to describe a number by referring to it as the power of another number. Commonly (and where no other information is given you can assume) logarithms - AKA logs - use powers of ten to describe other numbers. For example, 100 = 10^2, so the logarithm (log) of 100 is 2. Similarly, the log of 1,000 is 3, and the log of 10,000 is 4. Thus we can describe very large numbers using much smaller ones. Logarithms become marginally more complicated when the number we are describing is not a whole power of ten (for example, 2 = 10^0.30103: the log of 2 is approximately 0.3), but most modern calculators or spreadsheets do the detailed calculation for you, using the log function. Logarithms are used for decibel (dB) calculations. Any of a class of transducers whose primary purpose is to convert electrical energy into sound. A filter that allows only frequencies lower than its cut‑off point to pass. Low‑Pass Filter (see Low‑Pass, above. ‘Middle’audio frequencies. There is no universal definition of these, and because Mid can refer to such a wide range of frequencies, the further qualification of Low‑Mid or High‑Mid (or Upper‑Mid) is often applied. Alas, there is no universal definition of these terms either. In general discussion (or when someone asks for ‘more mid’ or ‘less mid’) it could mean any - wide or narrow - range of frequencies anywhere between about 250Hz and 3kHz. Midrange loudspeakers commonly cover a range from as low as 120Hz to as high as 5kHz. For this reason, other than for generalities Mid isn't a very useful word, although the Mid driver in a loudspeaker system will cover the range between the Bass and HF drivers (so ‘mid’ does tell us something useful about it), and if there are Low‑Mid and High‑Mid drivers it is also obvious which one is covering the lower and which the upper part of this range. On mixer channels with a single fixed Mid EQ, the EQ is typically centred somewhere between 1kHz and 3kHz. Single Swept Mid controls can sometimes cover a very wide frequency band (100Hz to 8kHz is not unheard of, although something in the order of 250Hz to 5kHz is more typical). Where there are two swept mids these can cover most of the audio frequency range between them, with the Low‑Mid covering from as low as 40Hz up to 1kHz or 2kHz, and the High‑Mid covering an overlapping range from 400Hz or so up to 10kHz and beyond. A device that combines separate audio signals. See the Mixers page for details of common mixer functions. Loudspeaker provided for musicians or engineers (rather than for the audience). See the Monitors page for more information. Most mixers have Mute switches enabling a sound-engineer to silence individual channels, groups, or other signal busses. Radio microphones also commonly have a Mute switch. Connectors in some types of socket (mainly 1/4″ jacks and bantam jacks) are able to break existing connections (or to make new connections) when a plug is inserted. If the socket has a default connection (its normal condition, when nothing is plugged into it) it is normalised. A common example is found on mixers with TRS jack inserts: without a jack in the insert socket the input signal passes directly from the channel gain preamplifier to the next section in the channel path (usually the EQ and/or auxiliary section). When a jack is inserted, this path is broken, and requires something to be connected between the tip (send) and ring (return) of the jack plug to complete the signal path. Musically an Octave is an interval of eight whole notes (twelve semitones). However, it also represents a doubling (or halving) of frequency, so that there is an interval of one octave between 500Hz and 1,000Hz, and an interval of two octaves between 500Hz and 2,000Hz. Unit of resistance (and, in AC circuits, of impedance). Omnidirectional. In microphones, equally sensitive to sounds arriving from any direction. Control for varying a signal's position in the stereo soundstage. Literally, of or pertaining to parameters. A Parametric EQ is one that has controls for all the parameters of EQ. Maximum. In an AC sine wave, the Peak voltage is 1.414 (√2) times the RMS voltage. In an audio signal the relationship between average, RMS and peak voltage is not predictable in the same way. However, in most industry‑defined loudspeaker tests (which almost universally use bandwidth‑limited pink noise as the test signal) the test signal is controlled so that the peak voltage is double - or in some cases four times - the continuous (i.e. average effective) voltage. 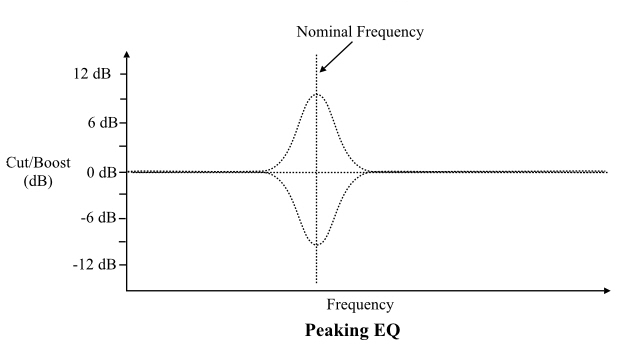 "Peaking" is used to describe the kind of EQ that produces a hump or dip at the selected frequency (which applies to most types of midrange EQ). The diagram below should make it clear why this is described as peaking EQ. Pre‑Fade Listen. A switch routing the pre‑fade signal (from a channel, group or auxiliary) to the mixer's meters and headphones. See the Mixer page for more details. Phantom power. DC voltage (typically 48V, but it can range from 9V to 56V) supplied through the microphone cable from a mixer's XLR inputs. This can be used to power external input devices (e.g. condenser microphones or DI boxes). Most condenser and electret microphones require phantom power to operate, and many other devices (e.g. preamplifiers and DI Boxes) that would otherwise run on batteries can run on phantom power. Pin 3 = +48V DC. When movement of electrons in a circuit is completely random, the result is equal distribution of movement across all frequencies. Because there are - in whole number terms - 500 times more frequencies between 10kHz and 20kHz (the highest audible octave) than there are between 20Hz and 40Hz (the lowest audible octave), the effect sounds like hissing: most of the energy is in the higher end of the frequency spectrum. This is known as White Noise. If a 6dB/octave filter is applied to white noise (so that with each doubling of frequency the amount of electron movement is halved), the result is Pink Noise, which has an equal amount of energy in each octave. The effect sounds something like a waterfall. Peak Music Power Output. My dad is four‑hundred, and our car does a zillion. A graph showing a microphone's sensitivity or a loudspeaker's output - usually stated in Decibels referred to (0dB) the on‑axis sensitivity or level, and usually for a number of frequencies - through 360°. Also see Beamwidth Plots and Isobar Plots. After (i.e. later in the signal path). Post‑fade or Post‑EQ happens after the fader or EQ section respectively. Before (i.e. earlier in the signal path). Pre‑fade or Pre‑EQ happens before the fader or EQ section respectively. A device that alters (processes) an audio signal. See the Processors page for further details. Q refers to Quality of Resonance, and in audio filter circuits - primarily parametric equalisers and crossovers - describes the narrowness of a filter (the higher the Q value, the narrower the filter). In audio filter circuits, Q can range from less than 0.26 (about 4 octaves) to 90 (about 1/60 octave) or more. A filter with a Q of 1.41 has a bandwidth of one octave. See the Parametric EQ page for more details. Reverb is an effect that mimics natural reverberation. See the Reverb page for more details. Find the square root of the result. Its most appropriate use in electrical terms is to describe effective voltage or current in AC circuits: the RMS voltage or current in an AC circuit is the voltage or current which would have equivalent value (i.e. it would produce the same heating effect) in a DC circuit. Power is calculated from the square of the voltage or current, using the formulae P=V2/R or P=I2 × R where P is the power in Watts, V is the potential difference in Volts, I is the current in Amps, and R is the resistance or impedance in Ohms. The result, P(average), is the average power in Watts (NOT ‘Watts RMS’!). RMS is often used incorrectly1 in the audio industry to describe power: the term ‘Watts RMS’ is as ubiquitous as it is inappropriate. The product (power, in Watts) derives from squared values, so the average squared value (MS) is relevant to the calculation of power. Power does not vary with time in the same way that potential difference or current varies: it is the amount of force that produces or expends an amount of energy in a set period of time3. Doubling the amount of force would double the amount of energy if the time remained the same, or produce the same amount of energy in half the time. It can only be measured by its observable effect (i.e. how much energy - usually heat - is produced in a given period), so the question: ‘how much instantaneous energy is being produced?’ hasn't a useful meaning4. In this context, there is no such thing as instantaneous energy. The product (energy, in Joules) does not derive from squared power values, so the average squared power value (Watts MS) is irrelevant to the calculation of how much energy is being produced, or is capable of being produced. In AC circuits, RMS only has technical validity when applied to voltage or current. If someone uses RMS to describe power, the best you can hope for is that they are talking about average continuous power calculated from RMS voltage or current (see above). More likely, however, they are using a technical‑sounding term without knowing what they are talking about. The reason they usually get away with it is that most of the people they talk to know even less. The difference between RMS and average varies according to the waveform. In a sine‑wave the RMS value is 0.707 times the peak value, while the average is 0.637 times the peak value. In a square wave both RMS and average values are equal to the peak value. In a musical signal - assuming it is not a square wave - the RMS value will be greater than the average value by some (generally small, generally indeterminate) amount. Whatever the waveform, the RMS value will always be equal to or greater than the average value. The Watt - the derived SI unit of power - is defined as the expenditure or production of one joule of energy per second. We can, of course, calculate a nominal instantaneous value from the instantaneous voltage and resistance, but how would this be useful? "Shelving" is used to describe EQ at the upper and lower ends of the audio frequency range where any boost or cut flattens out above (higher frequencies) or below (lower frequencies) the selected frequency. The diagram below should make it clear why this is described as shelving EQ (or shelf EQ). Literally, ‘beyond heart‑shaped’. A Supercardioid microphone has a narrower sensitivity pattern than a Cardioid microphone. A device that converts energy from one form to another. In PA systems this includes microphones (converting sound to electricity) and loudspeakers (converting electricity to sound), as well as contact pickups and other less common equipment. In Cables, TRS stands for Tough Rubber Sheath. TRS mains cables for touring systems are commonplace. A signal transmission protocol in which the signal is carried on a single core conductor, and the signal voltage varies with respect to the (0V) screen conductor. See Balanced, above. Voltage Controlled Amplifier. Many large‑scale professional mixers include a VCA section. See the paragraph on VCAs on the Mixer page for more details. The Volt (Symbol V) is the SI unit of electromotive force: the difference of electric potential capable of sending a constant current of one ampere through a conductor whose resistance is one ohm. The Watt (Symbol W) is a unit of electrical power (or rate of heat generation) represented by a current of one ampere flowing through a potential difference of one volt. It is the derived SI unit of power, equal to the expenditure or production of one joule of energy per second. The audible effect of random electron movement in audio circuits. Sometimes used as a symbol for impedance: Hi‑Z and Lo‑Z respectively refer to high‑impedance and low‑impedance.